Leamington C&AC's victorious masters' team of Sue Harrison, Jenny Jeeves and individual gold winner Kelly Edwards. Leamington C&AC’s masters ladies maintained their lead in the Midland Cross Country League at the weekend to take gold, while Kelly Edwards was awarded individual gold and Jenny Jeeves took home the bronze. 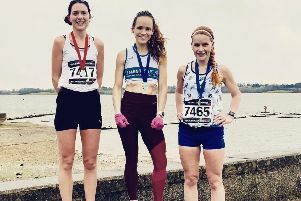 The fourth and final fixture at Gloucestershire visitor attraction Cattle Country saw runners take on a series of muddy and waterlogged fields with a few last-minute changes to the course due to flooding extending it to 7.6k. The windy conditions made the course extra challenging but the Leamington C&AC ladies took it in their stride with the senior team also climbing the rankings to finish fourth overall and sixth for the season - their joint highest-ever finish. 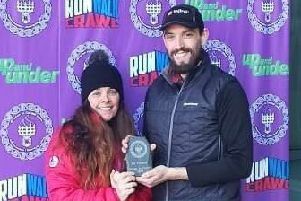 Edwards, who earlier in the week had been advised of her selection to run for Warwickshire in the Inter Counties Cross Country Championships in March, moved steadily through the field to finish a fine seventh and first master in 31:06. Megan McDonald (32:00)was 17th overall with Jeeves taking the second masters place on the day and 23rd overall in 33:03. Sue Harrison (34:20) was 41st and sixth master, with Zara Blower 45th overall in 34:51 despite having made a six-hour round trip from Manchester for the fixture. Callum Hanlon (273) finished inside the top 20 in the final race of the Birmingham League. Saffia del Torre (36:23) had been instrumental in setting the masters off strongly, scoring in the first two races and her 68th place gave her 19th master in this race. Spa Striders’ women finished eighth overall, with their masters second behind Leamington. Imogen Peck (33:45) was first Strider in, with Fiona Edwards (34:23), Jo Fleming (34: 56) and Laura Peake (35: 11) the other counters. Kenilworth Runners’ ladies produced a good team performance with just 44 seconds separating the first four runners home. A fine run from Connor Carson could not save Kenilworth Runners' men from the drop. Laura Pettifer (57th in 35:37), Marie Matthews (64th in 35:59), Rachel Miller (65th in 36:13) and Melissa Kennedy (68th in 36:21) counted for the senior team that finished tenth out of the 14 teams on the day and also overall for the season, securing their place in Division One for next season. In the masters’ event, Kenilworth finished third overall for the season with Pettifer, Miller and Kelly Burnett-Nicholl (78th in 37:07) counting on the day. Sarah Rose, who could not make the final event, still finished second master for the series. Leamington C&AC’s men, running at Lilleshall Sports Centre near Telford, knew that they had to pull out all the stops to avoid relegation from Division One of the Birmingham League. In the event, they finished close enough to BRAT to finish one place above the drop zone, with Callum Hanlon producing a strong run to place 20th overall in 30:39 for the boggy 5.5-mile course. Paul Andrew was 75th in 32:42, with Phil Gould 84th in 32:53. Vassilis Andreoulakis (33:13) and Dom Priest (33:21)crossed the line within eight seconds of each in 97th and 98th, respectively, leaving Iain McLaughlin (33:47) as Leamington’s final counter in 112th. Tom Foulerton (117th in 33:56) was first home for the B team and was joined by Dean Mawby (151st in 35:26), Jason Hill (166th in 36:15), Charlie Staveley (168th in 36:25), Craig Bower (173rd in 36:54) and Marc Curtis (183rd in 37:48). Kenilworth Runners joined BRAT and Telford AC in making the drop to Division Two after finishing last on the day and 15th of the 16 teams overall. Despite boasting a strong masters squad, Kenilworth were hampered by the loss of some outstanding juniors but are already targeting an instant return to the top flight. On Saturday, the counters for Kenilworth were Connor Carson (89th in 32:58), Andy Crabtree (102nd in 33:27), Dewi Williams (110th in 33:44), Stanley Doxey (115th in 33:51), Matt Dyer (140th in 34:49) and Nick Williams (149th in 35:14). Runners’ B team counters were Stewart Hopkins (154th in 35:34), Neil Cressy (162nd in 35:57), Stuart Underhill (192nd in 38:19), Wayne Briggs (197th in 38:44); Ryan Baker (201st in 38:57) and Craig Phillips (221st in 41:07). Spa Striders’ men came home eighth in the final race of the Division Two season at Park Hall Country Park in Stoke to finish seventh overall. Men’s captain Chris McKeown was a superb eighth in 37:54, with Ian Allen (38:14) tenth. Adam Notley (38:49), Aitor Tudero (40:24), Steve Taylor (41:12) and Simon Ludford (44.42) completed the A team scorers. Pete Teevan (45:18), Chris Wilson (45:47), Ian Davis (49:49), Ben Cohen (49:59), Rob Egan (52:37) and Matt Leydon (53:56) made up Striders’ B team.